The inaugural edition of the Bay of Bengal Initiative for Multi-Sectoral Technical and Economic Cooperation (BIMSTEC) MILEX 2018 wrapped up in Sunday in Pune after a validation exercise that was followed by an impressive closing ceremony at the Aundh Military Station here. The final day of the military field training exercise included tactical drills like hostage recuse by insertion of troops from helicopters, room intervention as well as House Cleaning Drill as part of Cordon and Search Operations, Raid on a Terrorist Hideout and neutralization of Improvised Explosive Devices (IED). The entire exercise was monitored and controlled through the Joint Command Post established with representatives of the participating contingents. 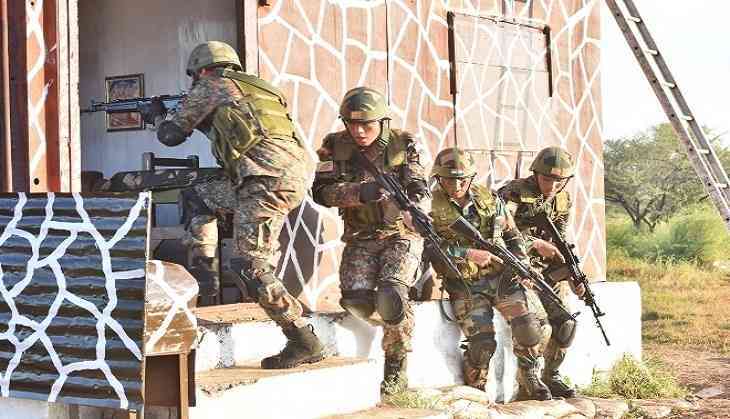 The Exercise demonstrated the commitment and capabilities of the participating BIMSTEC National armies in working closely with each other to eradicate the menace of terrorism existing in different forms. The Chief Guest of the ceremony was Dr. Subhash Bhambre, Minister of State (MoS) for Defence. The other dignitaries included Shahidul Islam, General Secretary of BIMSTEC forum, Service Chiefs of BIMSTEC nations, senior Military officers of the Indian Army and representatives of the BIMSTEC nations who witnessed a Joint Validation Exercise conducted at the training area of Aundh Military Station. The Validation Exercise was followed by an equipment display organised under the aegis of the Federation of Indian Chambers of Commerce & Industry (FICCI) at Aundh Military Station. Subash Bhambre along with the Service Chiefs and other senior army officers witnessed more than 250 indigenously developed defence-related equipments. It may be noted that almost 20 different agencies dealing with defence equipment participated in the display including Ordnance Factories, Defence and Research Development Organisation (DRDO), leading private sector companies, startups etc to showcase some of the latest weapon systems and vehicles produced indigenously. Addressing the media along with Army Chief General Bipin Rawat before the closing ceremony, Bhambre said, "The MILEX-18 Exercise has provided us all an opportunity to discuss the issue of Countering Terrorism from the military point of view with an endeavour to create synergy, better understanding and evolving of an institutionalized, mechanism for regional cooperation in the field of Counter Terrorist Operations. This Exercise and Army Chief's Conclave held yesterday will further augment the relations between all BIMSTEC nations." Bhambre also supervised an impressive parade show that saw the participating nations at the drill square of Aundh Military Station in the presence of dignitaries from the BIMSTEC nations. Captain Gaurav Sharma, who is a member of participating Indian Contingent commanded the parade during the closing ceremony. Hailing the exercise as a great success, Bhambre also praised the troops for the professionalism shown by them. "The exercise has been a grand success and has taught valuable lessons to the troops of the Bay of Bengal region in countering terrorism. The camaraderie and friendship developed between the contingents during the course of the exercise will assist in enhancing interoperability between the armies which may be called upon to collectively fight this growing menace of terrorism in the region," Bhambre concluded. The military exercise was commenced on September 10.